Does one of your shoes wear out before the other? Do you have chronic, unexplained knee or lower back pain? Do your feet feel uneven when you walk? If you answered with anything but no, you may want to consider orthotic inserts—one of the best and easiest methods of treatment for the troubled sole. At the Beaver Valley Foot Clinic, we help you identify, diagnose and treat foot discomforts. One of the most common discomforts we encounter at the Beaver Valley Foot Clinic is with sole and lower leg discomfort. These pains may seem unexplainable, and therefor untreatable. Yet, our experts know how to ease the pain and treat its source—and the solution may be easier than you think. Orthotic inserts, for instance, can help with lower back, lower leg, foot and sole discomforts. Keep in mind that the orthotic inserts available at your local store will probably not do the trick, and can often make your foot issues worse. You and your feet deserve professional, reliable treatment. Before you can fix a problem, you must first identify it. By recognizing and identifying your symptoms, and asking yourself certain questions, you can narrow down on the real issues behind your pain and discomfort. Figuring out how to express these bothers will allow your podiatrist to more accurately diagnose and treat issues causing them. 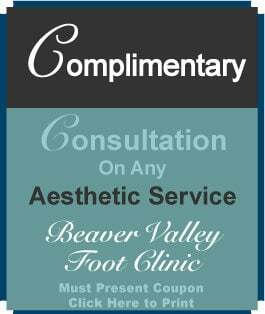 The Beaver Valley Foot Clinic is here to help treat your heel, lower leg and other foot discomforts. 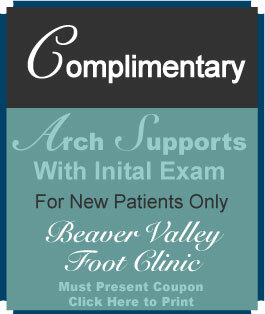 Start Your Pain Management, Now, with the Help of Beaver Valley Foot Clinic! At the Beaver Valley Foot Clinic, we have everything you need to identify and treat sole pain and other foot discomforts. Our highly recommended and effective orthotic inserts, for instance, are terrific options for foot pain management. Contact our experts at the Beaver Valley Foot Clinic today by calling (878) 313-3338. Call now, and start walking comfortably again tomorrow!